A detector can be a mechanical, chemical, or electrical device that measures the change of a variable in its environment. In Atomic Absorption Spectroscopy, the amount of radiation that passes through a sample is measured and quantitatively described by transmittance. As light passes through a sample, power is attenuated as it is absorbed by the analyte in the sample. Transmittance, T, is the ratio of the source radiation’s power exiting the sample, P, to the source radiation’s power entering the sample, P0. Transmittance can also be described as a percent, %T, when T is multiplied by 100. A large percent transmittance (approaching 100%) is characterized as a low analyte absorbance, whereas, a low percent transmittance (approaching 0%) characterizes a high analyte absorbance. Absorbance, A, can also be used to describe the attenuation of electromagnetic radiation as it passes through a sample. Absorbance is a more common unit of measurement for AAS because of its linearity to analyte concentration with respect to Beer’s Law. A photodiode is a photoelectric transducer that produces an electric signal, or current, I, which results from absorption of photons. Photodiodes consist of a reverse-biased pn junction in order to convert radiant power reaching the transducer, to a proportional current. The pn junction consists of two types of semi-conductor material, p-type and n-type. Both p-type and n-type materials contain silicon crystal, which is a well-known, commonly used semiconductor. In a silicon crystal, each silicon atom is bonded to its neighboring atom by four electrons, forming covalent bonds. To differentiate the p-type material from the n-type material, the silicon crystal is altered in a process called doping. During the doping process, impure atoms are introduced to the semiconductor silicon crystal. The p-type region is doped with boron atoms, which only have three valence electrons. This causes formations of “electron holes” in the silicon lattice of the p-type material. The n-type region is doped with phosphorus atoms, which have an extra valence electron, for a total of five valence electrons. This results in an extra electron free from the covalent bonds in the silicon lattice. These mobile free electrons in the n-type material diffuse to the electron holes in the p-type material, making the atom with a newly filled hole positively charged. Also, the mobile electron holes diffuse to the electrons in the n-type material, making the atom negatively charged. This formation of negatively and positively charged ions creates a region absent of mobile charge carriers known as the depletion region. The depletion region contains a potential difference that, once large enough, prevents any further diffusion of charge carriers. This results in the depletion region’s conductance being reduced to nearly zero. When radiation is applied across the diode, holes and electrons are formed in the depletion region which are swept through the device to produce a current that is proportional to the radiant power. Photodiodes require very low voltage and can easily be used in portable, battery powered instruments. Photodiodes are less sensitive than photomultiplier tubes, and have a spectral range from about 190nm to 1100nm. In a Photodiode Array (PDA), there are individual photosensitive elements called photodiodes (explained under photodiode). The individual photodiodes are part of a much larger integrated circuit on a larger silicon chip than a single photodiode. PDAs are one-dimensional transducers where the photosensitive elements are arranged side by side on the transducer face. A photomultipier tube (PMT) is used for the measurement of low radiant power. 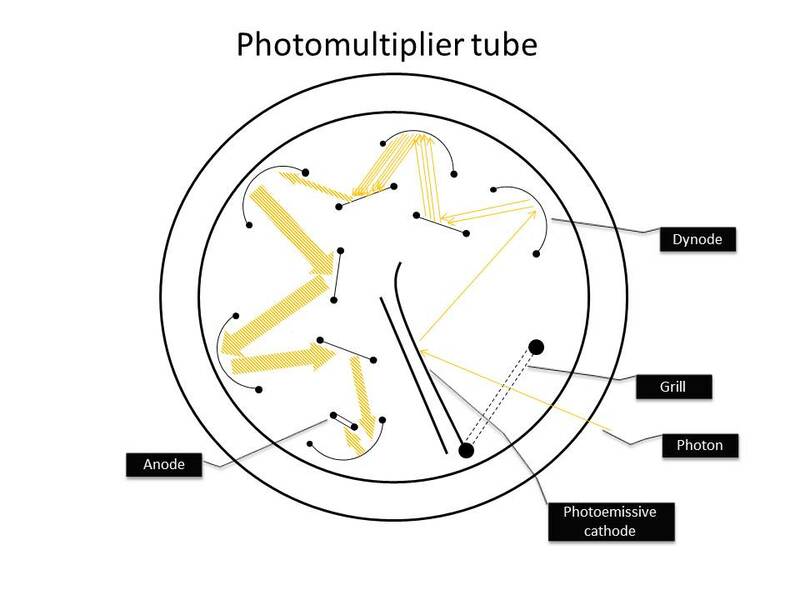 The schematic of a PMT is similar to that of a traditional phototube. In a traditional phototube there are two electrodes, an anode and a cathode. When voltage is applied to the electrodes, the photons hit the cathode and generate electrons. The electrons flow to the anode. The anode generates a photocurrent that can be measured. A diagram of a traditional phototube is shown to the right. A PMT, however, contains additional electrodes called dynodes. There are nine dynodes in all, and each dynode is more positibe than the previous dynode. This starts with dynode D1 which is ~90V more positive than the cathode. Because of the increasing positive charge, the electrons are accelerated towards the dynodes. After passing through all nine dynodes, 106 – 107 electrons have been formed for each photon. The electrons gather at the anode where they are collected in the form of a current. This current is then converted to a voltage and measured.One limitation of PMTs is the power of the radiation source. If the source is too intense, the light causes irreversible damage to the photoelectric surface. For this reason, PMTs are limited to taking measurements of low power radiation sources. To avoid damage by harsh radiation, PMTs are stored in a light-tight compartment.The major sensitivity limitation associated with PMTs are thermal dark currents, which result in background noise. Dark currents usually result from thermal emission. To reduce thermal emission, one could cool the transducer to ~-30 degrees Celsius. This can be achieved by circulating a coolant around the PMT. With the proper set-up and care, PMTs can be used to detect individual photons at the cathode.